Home » Tech Tips » Apps » How to Convert PowerPoint Presentation to a Video? How to Convert PowerPoint Presentation to a Video? Microsoft’s PowerPoint is a simple tool for converting your presentations into a simple video. You can convert your images into a video slideshow by adding text and various effects to it and the option is available from PowerPoint 2010 onwards. This article explains how to create a presentation with various effects and converts that presentation to a video using PowerPoint 2010. Select an appropriate page design under “Design” menu. If you are going to use a full slide image then page design does not really matter since all the designs will be covered by the full scale image. But if you are planning to use the slide content in your video then the page design really helps you to add more professional look to your video. Copy and paste all your images into your presentation one image per slide and resize the images to fit into the slide. You can add a starting slide and ending slide showing titles and credits for your video. 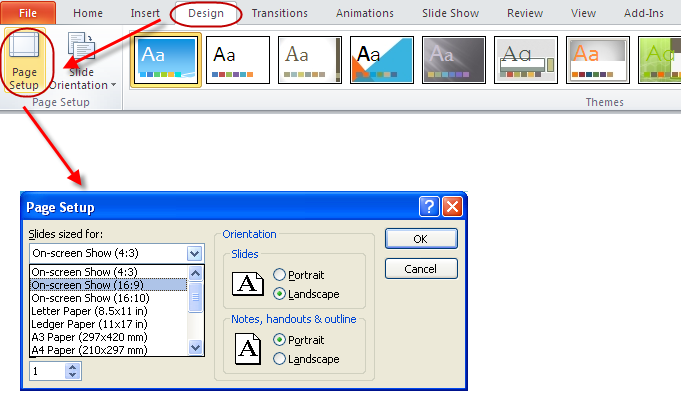 Transitions menu offers various options to choose how each slide should move and Animations menu offers options to choose animations for each items in any particular slide. Transitions and Animations together will give your video a stunning look. Choose your options carefully and check the timings between each item or slide by looking it in the full screen preview under “Slide Show” menu. Add audio to each slide using the option “Audio” under “Insert” menu. The audio option allows you to add an audio file, add a clip art audio and record your own voice as audio for each slide. The “Page Setup” option available under “Design” menu allows you to choose your video size. You can select any available options like 4:3 or 16:9 or choose custom option to define the height and width of your video. The final step is to save your presentation into a video format. Go to “File” menu and select “Save As” option, in the popup select the option “Windows Media Video (*.wmv)” to convert your presentation into a video file. You can convert any existing video into .wmv format using PowerPoint. Add video to your presentation using “Video” option available under “Insert” menu and save the presentation as “Windows Media Video”. Video quality may not look fine in some players, check the final quality by uploading the video into your website.